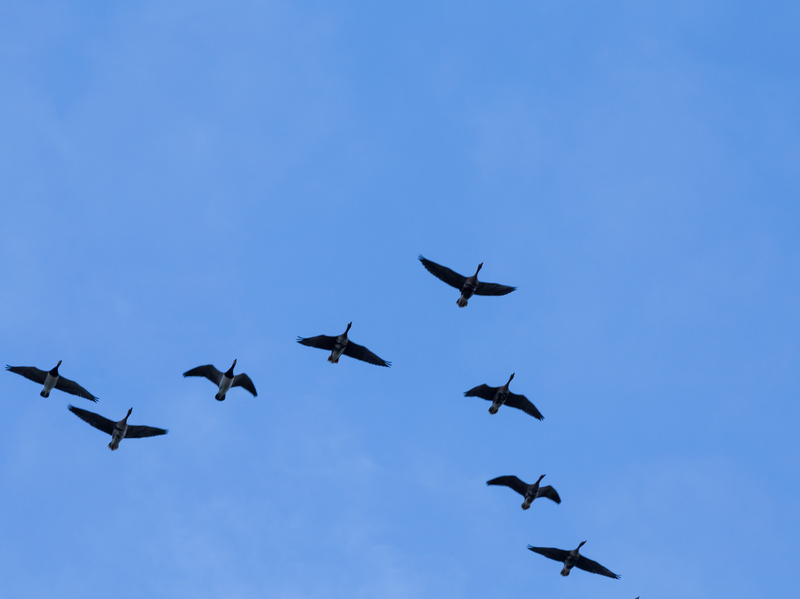 Migrating Birds Avoid Bad Weather — Which Makes Their Paths Predictable Scientists have developed a forecast model for predicting mass bird migrations, based in part on weather patterns. A new tool predicts where birds will migrate based on the weather. "Where it's going to rain can have interesting impacts on birds. It can sort of outright just shut down migration," explains Kyle Horton, a researcher at the Cornell Lab of Ornithology. "But right behind the storm can be really favorable conditions, so the migrants may take off as the storm sort of sweeps through." 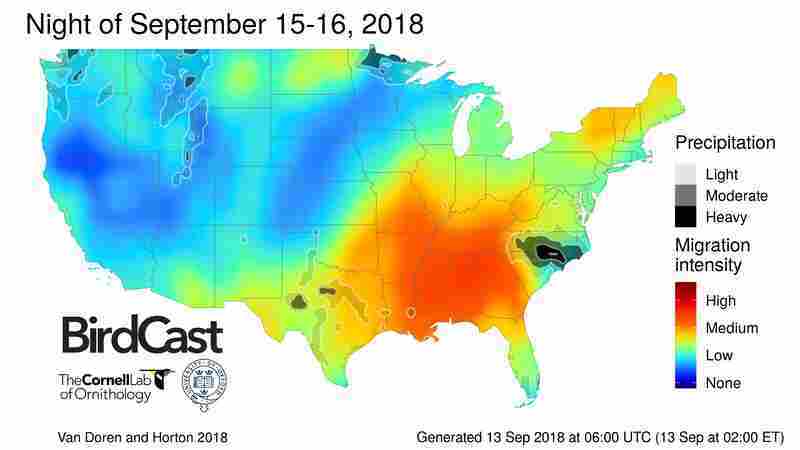 Using decades' worth of data on how migrating birds respond to atmospheric changes, Horton and a colleague recently designed a new forecasting system that can predict exactly when and where vast numbers of migrating birds will take to the air each night. "We developed this system to forecast bird migration for the entire United States. Our system essentially converts a weather forecast into a bird migration forecast," explains Benjamin Van Doren, an ornithologist at the University of Oxford the United Kingdom. 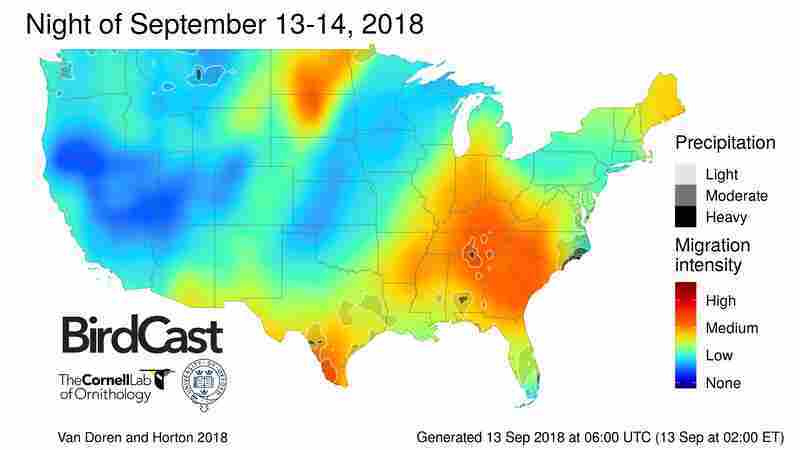 They call it the BirdCast, and it's currently predicting the greatest bird migration just to the west of where Florence is expected to make landfall. 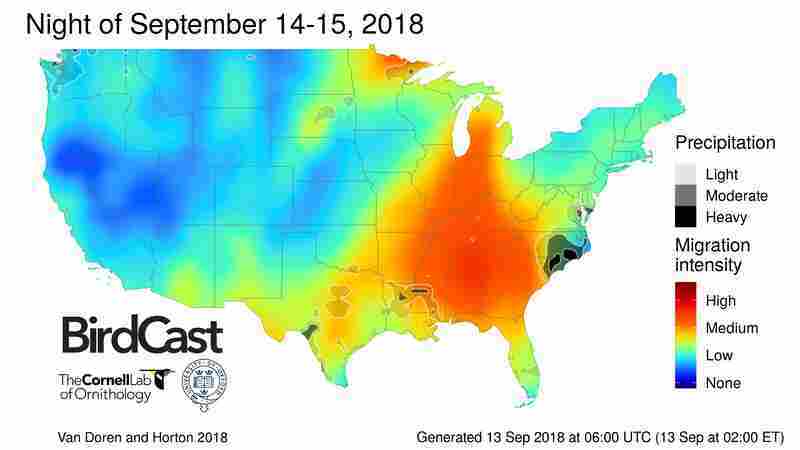 The BirdCast shows fewer migrating birds in the vicinity of Hurricane Florence's expected location. Migrating birds typically move at night, to avoid predators and to take advantage of a more stable atmosphere. For around 75 years, scientists have used radar installations designed to monitor weather to capture information about the secret nocturnal movements of birds, bats and insects. During the spring migration, as many as 500 or 600 million birds might be in flight across the continent on any given night, according to a new report in the journal Science. The numbers are likely much higher in the fall because juveniles hatched during the breeding season will also be on the move. "The numbers of birds in a peak night in mid-September over the entire U. S. are certainly several hundred million, maybe over a billion. But we're still working on that," says Van Doren. Each day's BirdCast makes a prediction for one, two, and three days ahead. Color maps show the different intensities of migration, with the greatest numbers of birds looking like red blooms on the map that appear just as the sun sets. "These migrants to take to the airspace, and that shows up in this sort of sweeping fashion across the United States," says Horton. "As the sun is setting, we'll see the progression of migration taking place." He says their forecasts are pretty accurate, and have been able to explain more than 80 percent of the variation in migration timing and intensity. Bird-watchers have started to notice, and are already using the maps to decide when and where to go out looking. What's more, the researchers hope their forecasts could help people protect bird migrations by taking steps like turning off wind turbines that can hit birds, or switching off city lights that can lure the migrants off course. "Having enough lead time and predictive power to forecast where birds will be, when they'll be in the airspace, has tremendous conservation value," says Horton. Birds will likely hunker down for hurricane Florence, and any birds caught in the storm could get blown far off course. "From the radar perspective, we'll see birds trapped in the eye. It shows up on the radar signal as being bird-dominated in the eye alone," says Horton, noting that birds will likely show up in the eastern U. S. that normally wouldn't be anywhere near there — something that's exciting for bird watchers, but likely a lot less fun for the birds.